The Perfect Answer To Reduce Belly Fat. Relacore is the only full strength, broad spectrum Relacortin? formula available in the USA. The most potent stress-relieving, mood elevating energizer specifically designed to reduce the accumulation of stress-induced cortisol, a leading cause of belly fat accumulation. Reduce Belly Fat with Relacore? Relacore is the most significant advancement in belly fat control in more than a decade. Relacore's natural anti-stress, mood elevating formula can help positively alter the underlying stress-related causes of excess belly fat... leaving you happier, full of energy and with that flat, youthful tummy you thought you?d never see again. You're going to love what Relacore can do for you! Not only can Relacore reduce stress-induced belly fat in conjunction with proper diet and exercise, but Relacore also helps balance hormone levels that cause stress-induced belly fat and encourage overeating. Relacore is the best way to control the accumulation of cortisol and belly fat because the formula nips the problem of stress and anxiety in the bud, so to speak. Because it works! Relacore is a non-sedating, mild anti-anxiety mood enhancer that reduces stress-induced cortisol production by helping to minimize stress. Not only can Relacore reduce belly fat in conjunction with proper diet and exercise, but it also helps balance hormone levels that cause stress-induced belly fat and encourage overeating. 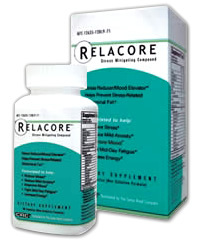 Relacore is entirely stimulant-free, with no known side effects. By including Relacore in your daily routine, you will reduce stress, decrease mild anxiety, improve your mood, increase your energy levels and fight that mid-day fatigue we all face. If you're looking for a natural way to fight the stress-to-belly-fat cycle, you've got to try Relacore. Just add Relacore to your sensible diet and exercise program! Order Now!